In fact, most towns aren’t created at all. They just happen. The decade of careful planning that preceded the first turn of a shovel at Babcock Ranch is just one of the countless ways Babcock Ranch sets itself apart. With a seamless melding of modern technology and timeless hometown charm – all nestled within expansive natural spaces – America’s first solar-powered town provides a whole new way of life. The first three neighborhoods at Babcock Ranch—Lake Timber, Trail’s Edge and Parkside—feature a diverse mix of single family home styles. Homes in Lake Timber start in the mid-$300s. Trail’s Edge offers Lennar homes from the low $200s and Parkside by Pulte Homes has homes starting in the mid $200s. Subscribe to Babcock Ranch emails to stay informed as we announce new housing and builder options in future phases of Babcock Ranch. 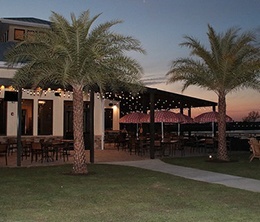 From morning exercise classes to live music at the lakefront Table & Tap restaurant, the daily buzz of activity at Founder’s Square in Babcock Ranch gives a familiar hometown vibe. All are welcome to stroll the boardwalk, relax in the shade or cool off at the splash pad. Take an electric boat tour or rent a kayak at Curry Creek Outfitters to explore Lake Babcock. Grab a salad, sandwich or some produce to make your own meal at Slater’s Goods & Provisions, our market café. Enjoy a raw juice or smoothie at our newest addition to Founder’s Square- ReCharge Juice Co. located in the Healthy Life Center. And don’t forget the sweetest treats come in squares at Square Scoops Coffee & Creamery! Be sure to check out our events calendar for festivals and other fun events all can attend. Table & Tap is our lakeside farm-to-table restaurant located in Founder's Square, downtown Babcock Ranch. The mission and menu of Table & Tap reflects the values of the town: Returning to the roots of farm-to-table dining, serving fresh, locally sourced ingredients with a modern, artisan flair. Slater’s Goods & Provisions is a market and café at Babcock Ranch. We offer a farm-fresh menu, self-serve salad bar, as well as a marketplace to grab fresh ingredients to make it on your own. Packaged wine and liquor is also available. View Slater's To Go Menu, here. Square Scoops is the ideal dessert stop after a nice dinner at Table & Tap. Offering specialty coffees, ice creams, sorbets, sundaes, milk shakes and more, Square Scoops will soon be your next guilty pleasure. The Hatchery is an office and coworking space for entrepreneurs and small businesses of all ages to share ideas and collaborate on new ideas. Curry Creek Outfitters is the best place to begin an exploration of Babcock Ranch. Pick up all your outdoor gear like wildlife booklets, sunscreen, outerwear, fishing gear, and more. Rent kayaks, canoes or bicycles to explore the town from a whole new view. Be sure to sign up for a free cruise on our electric boat, departing daily at noon and 2 pm, weather permitting. The ReCharge Juice Co. is conveniently located in Founder's Square inside the Lee Health Healthy Life Center. Serving freshly pressed juices, smoothies, and more, for you to ReCharge before or after you workout. Choose one of our delicious raw juice recipes or make your own and share it on Instagram with #HowDoYouReCharge? "The nation's first solar-powered city -- a cluster of homes, offices and factories less than 20 miles from Fort Myers on the Gulf Coast."